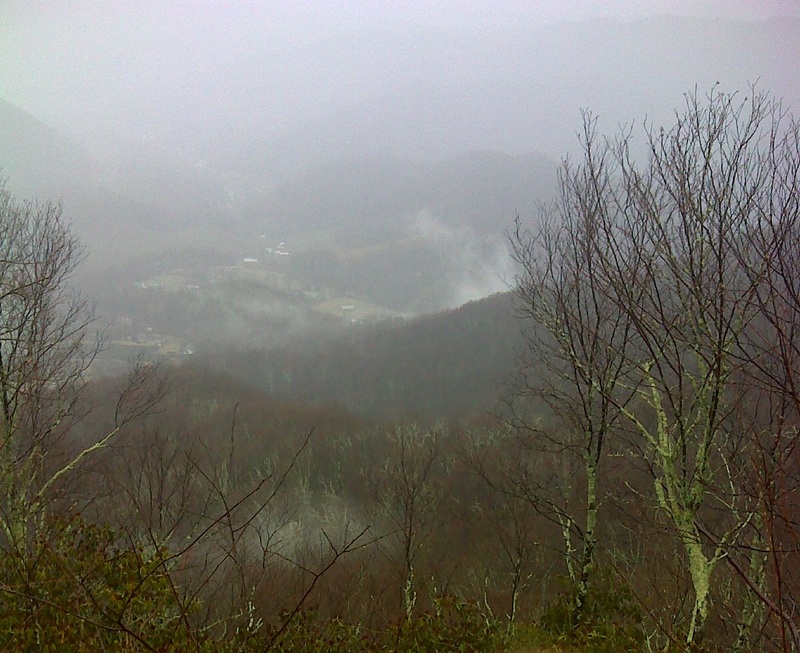 I 'stole' a bit of Appalachian Trail that it didn't want to give me today. A sane person had no business on top of Hump Mountain at noon today (Feb. 16th). The wind was howling. The steady driving rain was blowing horizontally, penetrating even the most rain-resistant clothing. It was the kind of high mountain weather they warn you about. But there I was, stealing my way across a mile of exposed high bald, making my way to the 5587 foot summit and then retreating back into the stunted, weather-wracked forest - in and out like a bandit. Still, it was a short day. I wanted to do more, but sanity finally prevailed. Today's entire out-and-back hike consisted of that 2500 foot ascent to Hump Mountain and the return descent. Down low I passed the Apple House Shelter and adjacent old mines. The shelter was once a dynamite storage hut. Farther up, there's a big rock overhang that could serve as an emergency shelter for a person or two. They you pass a nice vista at a rock outcrop. I stole a view there despite the fog ... in and out like a bandit. Up at 4400 feet you pass Doll Flats - a great place to camp. There are wooded areas with huge twisted oaks and open grassy meadows. And beyond a fence the pasture falls away in a sudden precipitous drop, affording a view of the valleys below. 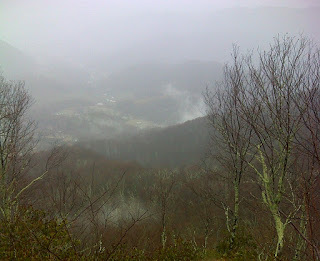 Stole another view there - everything was totally fogged in on my return. From Doll Flats the trail ascends steadily on a wooded side-slope that is a difficult walk, particularly in rain, mud and lingering slushy snow. It's very rocky, so picking your footsteps carefully, one after the other, is the order of the day. Then finally - and very suddenly - you reach the brink of a 'cliff' in a stunted jungle, turn right in knee-deep snow drifts and emerge onto the first of the magnificent high balds of the NC/TN border. Hump Mountain is just the first of five or six in quick succession here in the Roan Highlands, all the way down to the Roan Mountain complex. Here, near the summit of Hump Mountain, stands a memorial plaque to Stan Murray, former ATC chairman who worked to get the AT relocated over these balds. Thank you Stan ... I plan to be back here tomorrow, coming from the other direction, and hope to take in more of the scenery and less of the gnarly wet stuff!